I have performed as Twain in 44 States. I have been endorsed by the curator of the Mark Twain Museum and a Professor of Mark Twain Studies at St. Mary’s College. I often participate in meet and greets and skilled in using many of Mark Twain’s one liners in conversations with guests. Question: How are you Mr. Twain? Answer: Not bad for a guy who’s been dead for 100 years! Mark Twain look alike Impersonator has been impersonating Mark Twain as a professional Mark Twain Lookalike Impersonator and is the most requested Mark Twain Lookalike Impersonator in the nation. 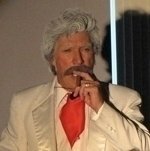 He has been invites to speak as a Mark Twain lookalike Impersonator all across the country and has never disappointed. Born on November 30, 1835, in Florida, Missouri, Samuel L. Clemens wrote under the pen name Mark Twain and went on to pen several novels, including two major classics of American literature, The Adventures of Tom Sawyer and The Adventures of Huckleberry Finn. He was also a riverboat pilot, journalist, lecturer, entrepreneur and inventor. Twain died on April 21, 1910, in Redding, Connecticut.